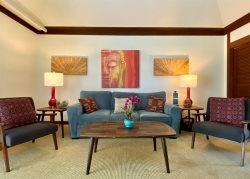 Great Vacation Retreats does not offer rental gear, however, we are happy to refer you to Ready Rentals on Kauai that provide this service. Beach Gear e.g. beach chairs, beach umbrellas or Popup Sunshelters and beach coolers. Baby Gear e.g. high chairs, booster seats, swings, gates, bouncy seats and wagons. Bedding Options e.g. Rollaway Beds, Full Size Wooden Cribs and Portable Cribs. Wheel Chairs e.g. Regular, Transport or Extra Wide available.